Taipei Post Office (Chinese: t 臺北郵局, p Táiběi Yóujú; Minnan: Tâi-pak Iû-kiȯk) or Taipei Beimen Post Office (臺北北門郵局, p Táiběi Běimén Yóujú; Minnan: Tâi-pak Pak-bûn Iû-kiȯk) is a four-story building located close to Beimen (lit. "North Gate") in Taipei City, Taiwan. It is a third-degree historic site of the Republic of China. It was constructed as a building with two huge wings and one small front opening. With the large open ground immediately behind the main building, the total ground floor is about 8,000 square metres. It is the headquarters of Chunghwa Post in Taipei. Some of its space is used as the Taipei Campus of National Chiao Tung University. Chunghwa Telecom used to have one of its operation centres here, but since the telecom business has divided into different sections, the original space was transferred to the National Chiao Tung University. March 1895 marked the end of the First Sino-Japanese War when the Japanese troops from Hiroshima came to conquest their land on the Pescadores. After they have claimed ownership on all the Pescadores’ islands, the Japanese set up their Military Post Office there, which became the first post office in Taiwan established by the Japanese. After a short war in 1895 (the Japanese invasion of Taiwan), during the beginning of the 20th century, Taiwan entered “the Japanese Colonial Period.” From 1895 to 1900, the Japanese established 23 post offices around the island. 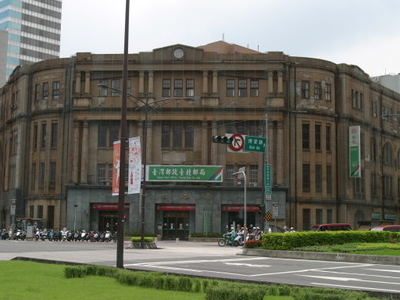 Among these post offices are the three headquarters in Taipei, Taichung, and Kaohsiung. These post offices were mainly for military mailing services and were under the telecommunication sector. Here's the our members favorite photos of "Historical near Zhongzheng". Upload your photo of Taipei Post Office!